Can a living trust be used to avoid probate? In the state of Washington, the process of probate is for managing the estate of someone who has recently died without leaving directions on what to do with his property and assets. Going through the probate system ensures that the person’s final affairs are settled, and all assets and debts have been distributed or paid off according to strict rules that are dictated by state law. However, probate comes with some considerable disadvantages for many estates, and it may be desirable to avoid the process as much as possible. If you want to have control of how your assets are distributed when you’re gone, a living trust is a tool you can use as part of your estate plan, and it can help your heirs avoid the considerable time and expense of the probate process, as well. Here’s what you need to know about getting started with a living trust. Starting a living trust in the state of Washington isn’t difficult, but it does take some care and planning. 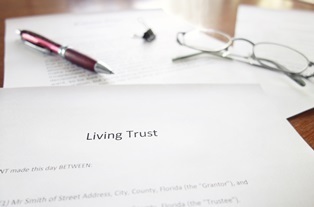 At its heart, the living trust is a document that establishes a legal entity (a trust) in which a trustee is named and describes who will receive the property held by the trust when you die. These assets will transfer directly to the heirs or beneficiaries that you’ve chosen, without the need for probate court intervention. There are two types of living trusts that are commonly used in the state of Washington: the revocable trust and the irrevocable trust. Deciding which trust is right for you is a matter to discuss with your attorney, as each has advantages and disadvantages that can affect your estate, including tax implications and rules about who can alter the terms of the trust. Revocable trusts are a common choice for many estates, due to the flexibility they offer. Regardless of which type of trust you choose, your trust must be funded to be of use. To fund a trust means to transfer the ownership of assets and property into the trust’s name. Only assets that are in the trust can be transferred upon your death to the beneficiaries, so it’s important to ensure that you fund the trust with all the assets you wish to pass on. Other kinds of assets may be put in the trust, as well, but there are some that you may not want to use to fund your trust, such as a 401(k) or certain other retirement accounts. The transfer of ownership can incur stiff tax penalties for early withdrawal on these types of accounts. Usually, these plans have their own provisions to name a beneficiary upon death, so the use of a trust is unnecessary. When in doubt, your attorney can help you decide which assets would be best used to fund your trust and which are best served by other parts of your estate plan. A living trust is just one part of a complete estate plan, and it is rarely enough on its own to provide complete legal protection for your assets when you pass away. An estate planning attorney can help you decide how to build an estate plan that fully covers your needs and the needs of your family, so that you can ensure your loved ones are cared for after you’re gone. If you have questions about starting a living trust or are ready to discuss your own estate plan with a legal professional, the Law Offices of Molly B. Kenny is here to help you. We have decades of experience helping families prepare for the future, and we look forward to serving your family, too. To arrange a private consultation in our Bellevue office, please call, or use our contact form to send us an email today.